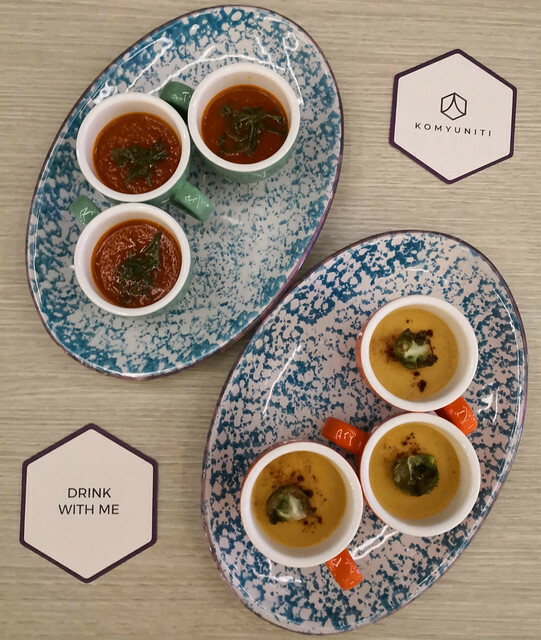 Tucked on the 10th floor of YOTEL is KOMYUNITI, a venue where people connect over nice food and drinks. It is a bar, restaurant, alfresco terrace and a co-working space combined together. KOMYUNITI means ‘community’ and this is evident in the furnishings and layout that invites guests to network, socialise, co-work, eat and drink. 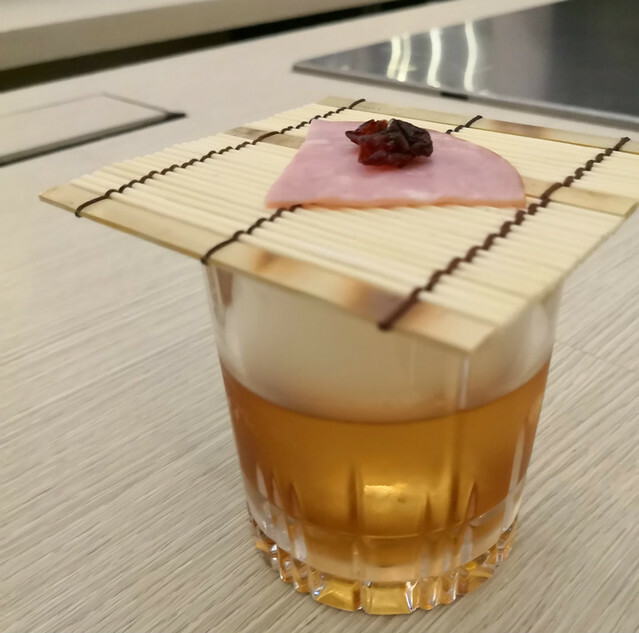 Helmed by Head Chef Mark Tai and F&B Manager, As’ad Isnin, expect yummy modern Jap creations crafted via their very own culinary and mixologist experiences and interpretations. Being just recently launched on 1st November, I love the feel of having mod-Jap cuisines in these sleek, stunning surrounds. 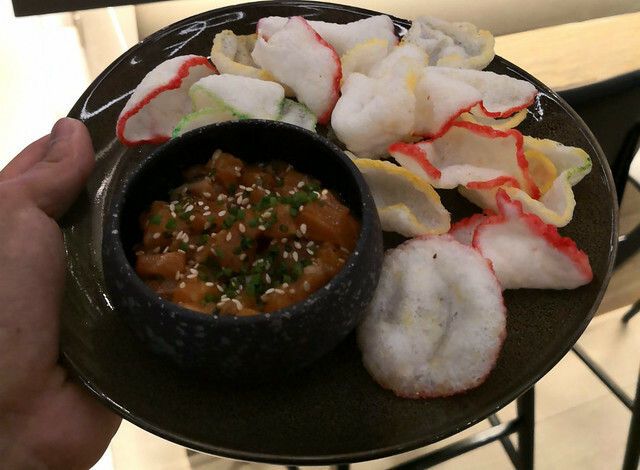 To start, we had the Salmon Poke – marinated cubes of salmon served with crispy fried onion crackers on the side. Very Hawaiian-vibe, very refreshing with a hint of spiciness (house-made Chili Sauce), the salmon has to be really fresh to be served as poke. Next, we had the Curry Corn Soup and Mama’s Tomato Soup. I particularly love the cream of corn, with its curry spices for a surprising touch without being too overwhelming. Comes in plate of 3 cups, these small plates are perfect for those having a small intimate gathering. It is so easy to pop this plate of Buttermilk Fried Chicken. I love the mouthfeels when bite into the cornmeal crusted skin, it is not oily at all yet so juicy and tender. Would be good if the sweet potato mash can be a heap too! Obviously, the high-quality proteins take the lead here. 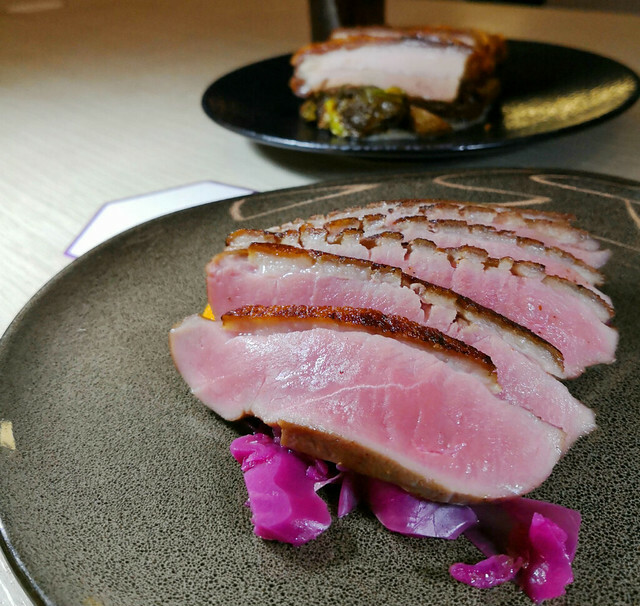 The pinkish Slow Roasted Duck Breast packs that meaty, flavourful punch even though they are thinly sliced, while the Roasted Pork Belly possessed a full-bodied taste, it is thankfully not salty but savoury. The meat-fat ratio is evenly distributed and the crispy crackling skin is a clear winner. If you don’t drink you haven’t been to KOMYUNITI. Just kidding, but the bar does mix pretty interesting cocktails that suits the style of refined, contemporary Jap. KOMpliment, KOMYUNITI’s signature cocktail, is fruity and fragrant, and made with butterfly pea flower-infused gin for that delicate touch of iridescent purple. We’ve also tried tropical cocktails like the vanilla-infused gin Tiki Chin Chin, sours like vodka-based Chaussettes, and bittersweet Benjamin Button. The one kicker for me is Fat Roger. Perhaps I overindulged so the fat-washed bourbon suits that occasion. To drink you will need to first roll the smoked ham with dried cranberries, eat it and then wash it down with whisky. To sum up, KOMYUNITI hosts quite an extensive selection of delectable dishes and fancy cocktails with a welcoming, feel-good environment. Pig out this Chinese New Year at Ginger, Park Royal on Beach Road as Executive Chef Vincent Aw serves up extensive auspicious culinary delights. The all-day dining restaurant features an array of delicious dishes up for kiap-ping like Braised Pig Ear Terrine with Chinese Herbs at the Salad station, Baby Lobster with Abalone Sauce, Abalone Fried Rice, and Braised Dried Oyster with Sea Moss on the Hot Food isle. What is special is the D.I.Y Yu Sheng station. 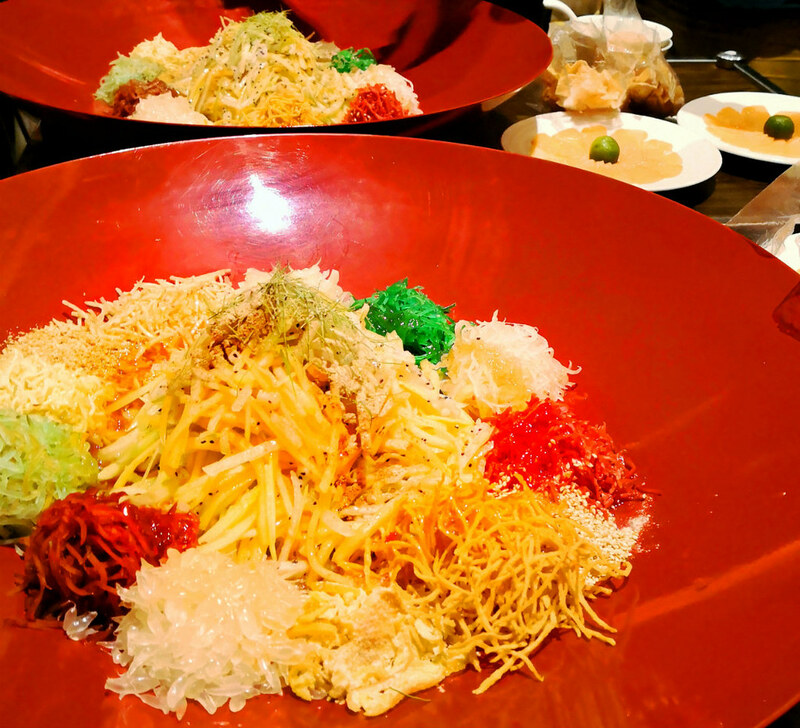 Perhaps the first in Singapore, you can create your own Prosperity Yu Sheng at the Yu Sheng counter to toss up a good fortune. Here are a few dishes that I’ve kiap-ed (or grabbed) and enjoyed thoroughly, so if you’re here for the CNY buffet you can go straight to hog these yummies out. 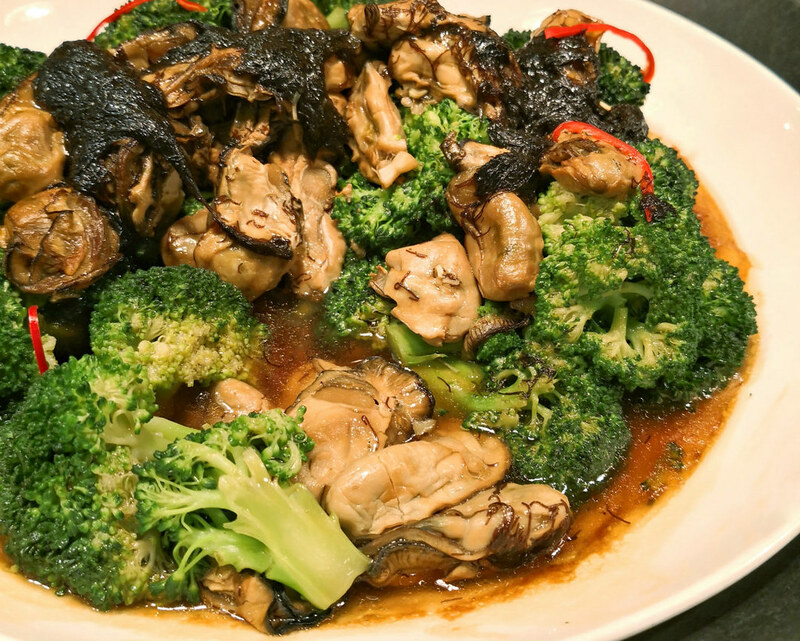 As an unrepentant carnivore more often than not I will just fly towards the meat station, but the pot of Broccoli with Dried Oyster is just visually desirable. The green broccoli possessed that nice crunch, soaked in a rich oyster broth to give off that distinct umami taste; very flavorful and back of my mind patting myself for being a healthy picker for a change. Priding themselves on serving consistently good quality crabs throughout the year, this Baby Lobster with Rich Abalone Broth is a dish I will indulge over again and again. Cooked a la minute at the live station, the lobster meat is fresh with a good springy bite, and pretty easy to peel off the fresh from the shell. Just remember to drink it hot as the taste will be slightly off when it’s cold. Other Chinese favorites I raved includes the very tender, very juicy Braised Pig Trotters, Abalone Fried Rice (wok-hei power strong in this one), as well as the Pineapple Salad with Sliced Bak Kwa and Braised Pig Ear Terrine with Chinese Herbs at the Salad station. 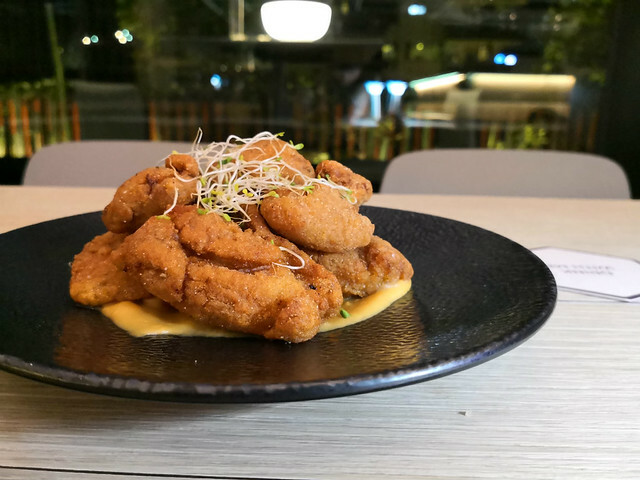 Besides these yummy CNY specials, also available at the hot isle are the surefire hit Baked Salmon topped with deep-fried fish skin – a good source of protein and omega 3 which I have many helpings. Chinese New Year is never complete without stuffing yourself aplenty with decadent treats and delicacies. 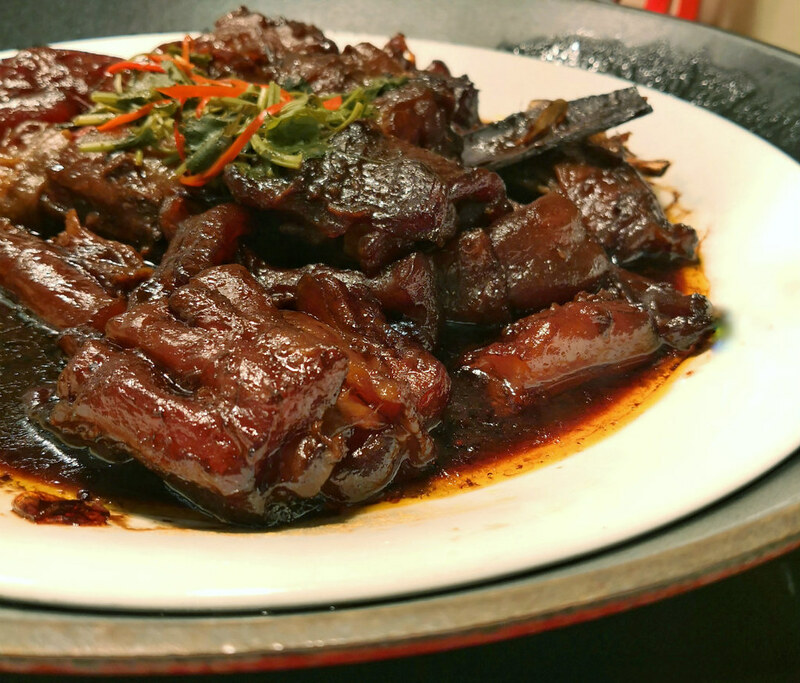 Make Ginger the go-to restaurant for your CNY indulgence and book today! 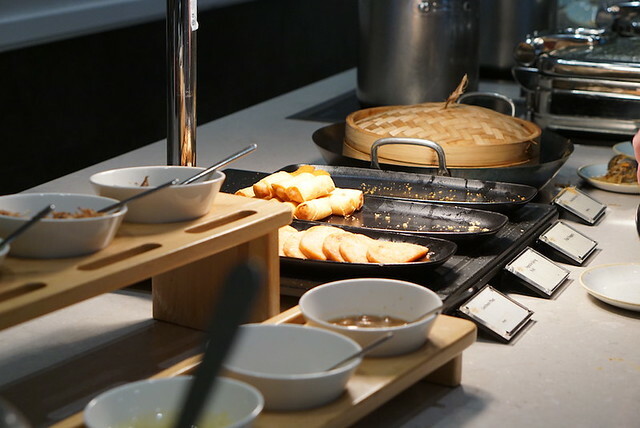 Known for its dim sum and mouth-watering egg tarts, Song Garden has been a favourite for many families. 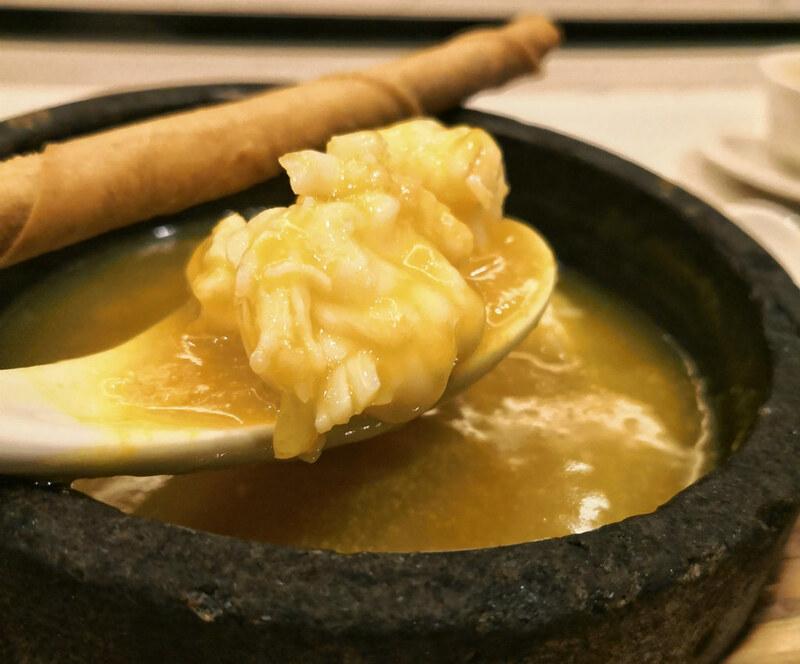 Located on level 2 of Mercure Singapore Bugis Hotel where Bugis Street meets Bras Basah in one of Singapore’s more authentic areas, Song Garden offers a trove of auspicious modern Cantonese dishes to user in a prosperous Year of the Pig. Reunion feast anyone? 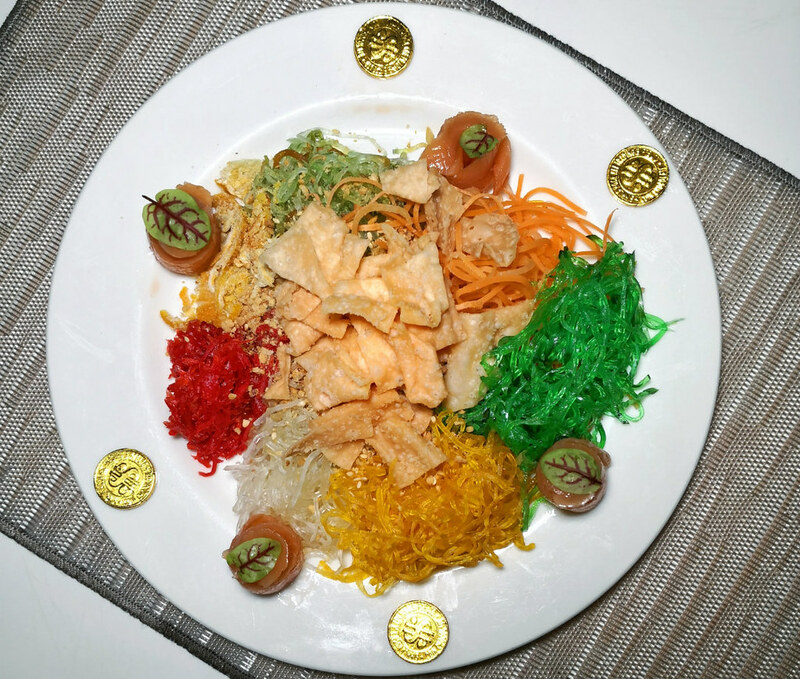 What can be more celebratory than a toss of Yu Sheng? The Prosperity Salmon and Fresh Fruit Yu Sheng has all the tried-and-tested essentials of Yu Sheng inside the giant bowl of auspicious red. The wooden chopsticks are much longer than usual to accommodate such a big bowl. The simmering Lobster with Pumpkin Puree served in Hot Stone Pot with Bacon Scallion Pencil is popular with the diners. The delectable pumpkin puree is now enhanced with generous amount of lobster meat. It was so delicious that I slurped up every last drop. Careful don’t touch the rim because it is scalding hot. Nothing shouts more CNY than Pen Cai. The Song Garden Supreme Fortune Pot is braised full of delectable delicacies like 8-head Abalone, Roast Duck, Crispy Pork Belly, Dried Oysters, Sea Cucumber, and the naturally sweet Scallop – which I fell in love with. One sip of the thick gravy will bring you to taste bud heaven. 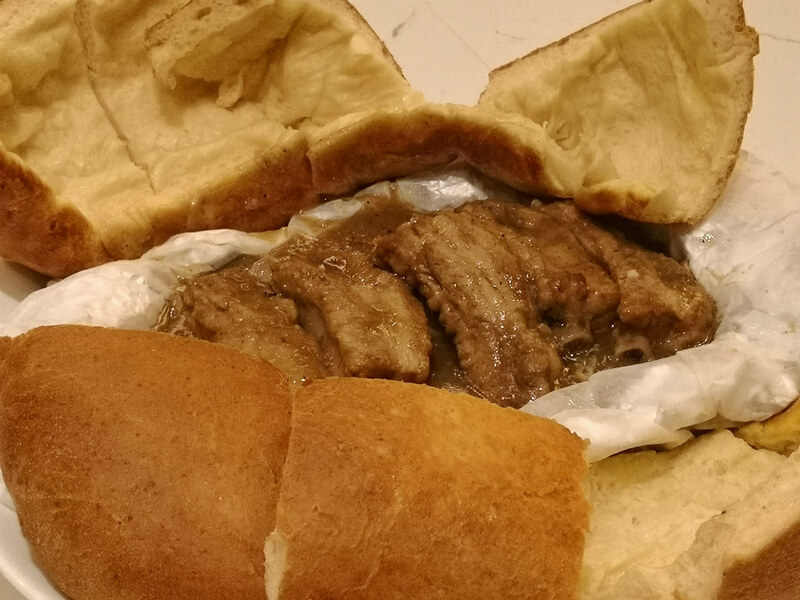 Don’t leave without giving the Golden Pillow White Pepper Pork Ribs Bun a try. An absolute crowd-pleaser, this savoury peppery pork ribs suits perfectly with the white bun custodian of pillowy texture. Brought back childhood memories of my great-aunt’s version of this irresistible dish. 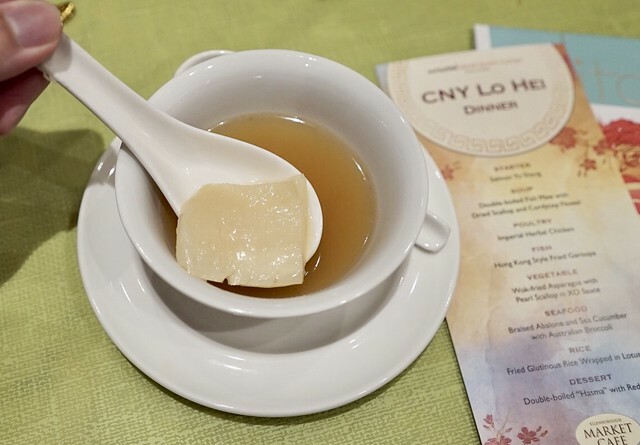 For those with a sweet tooth, a great end to the meal is the Double-boiled Peach Resin with Fungus and Red Dates. Cooling and refreshing, this traditional dessert screams Cantone-sia. You’ll find it hard to stop at just one sip. 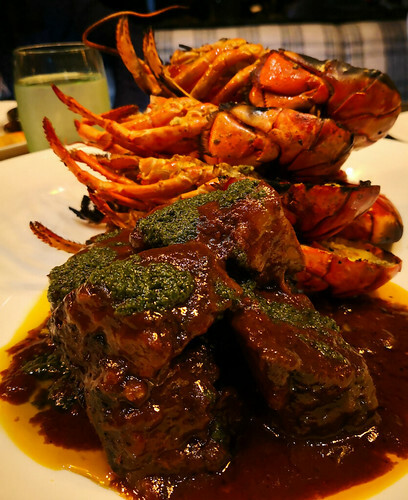 Surf & Turf = seafood and red meat matchmake in heaven. Seafood lovers are in for a mouth-watering treat this September. 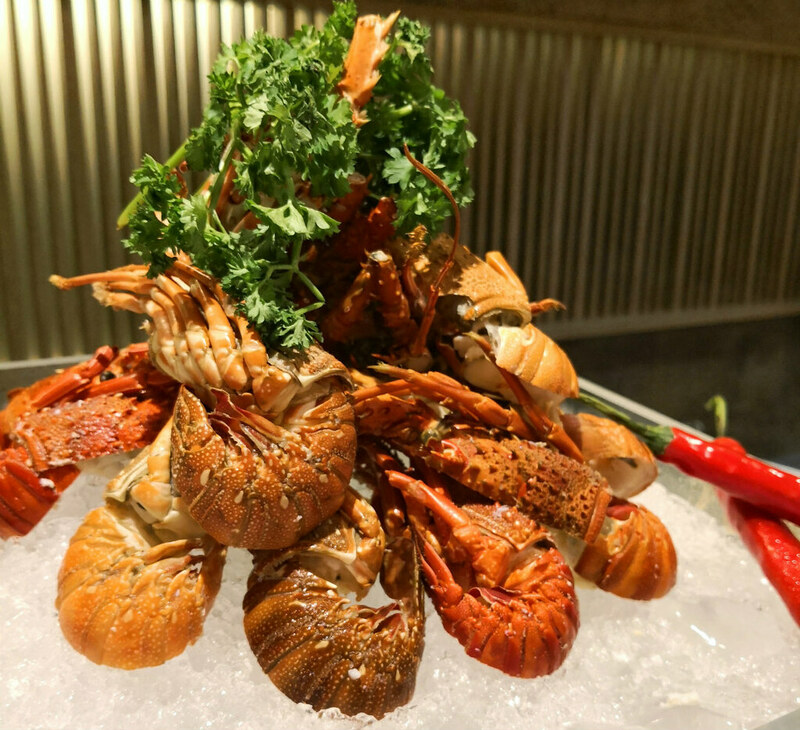 Sky22 in Courtyard by Marriott Singapore Novena has recently launched the September Seafood Bonanza – a seafood themed buffet available every Friday to Sunday from 1 to 30 September. At a ridiculously affordable price from $48++ per adult (lunch) to $56++ per adult (dinner), you can sample a medley of your favorite fresh and cooked seafood without bursting your budget. 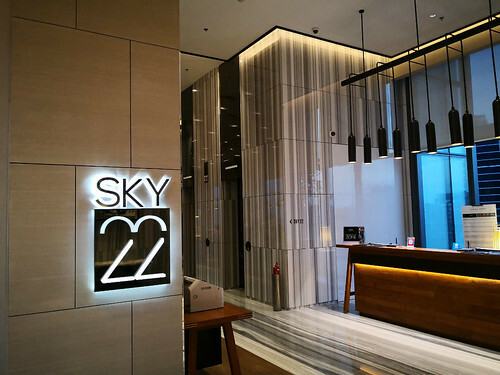 Located on the 22nd floor of the famed hotel, Sky22 gives quite a nice view of its surrounding precinct. Best to make reservations prior to coming here as the seats (100 guests’ seats in the restaurant, 12 guests in the private dining room) can be filled up quite quickly. The buffet spread features appetizers such as Poached Salmon with Fennel and Zucchini, smoked tuna, smoked marlin, salads and assorted sushi. There is also a seafood-on-ice counter with fresh prawns, mussels and scallops. I know, there are some who would prefer cooked seafood. You can sip into piping hot bowls of Clam Chowder or Seafood Chowder. I tried the Seafood Chowder, it was just exquisitely delicious, savory enough to open your palate for the main feast. 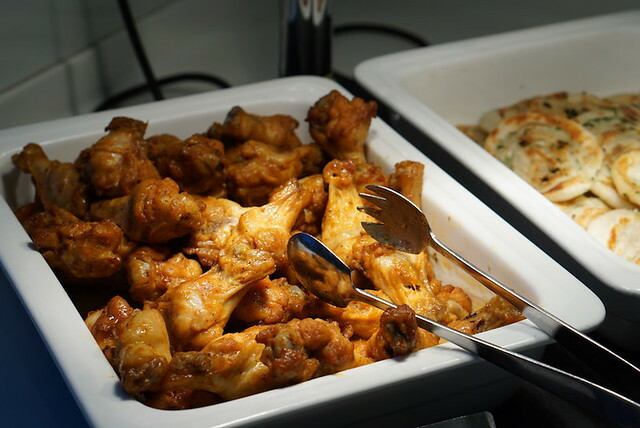 One key highlight of the seafood buffet spread is the cook-to-order a la carte buffet spread with over 17 all-you-can-eat main courses and side fares. With favorites like Green Lip Mussels Pomodoro and Crab Quiche, the list is quite extensive so we’ve selected a few dishes to sample (even though the gluttony me wanted to had it all!). We got ourselves the Surf & Turf, which is my personal favorite. Each mouthful of the braised short ribs was rewarded with a quintessential doneness and flavor. The lobster meat was fresh and divine. I had a fair share of the Oyster platter, which comprises of three different preparations (Rokefeller, Kilpatrick & Mornay). 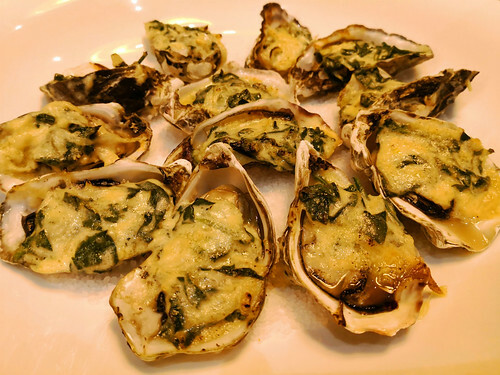 Of all I love the Mornay for its natural oyster sweetness and mellow topping. 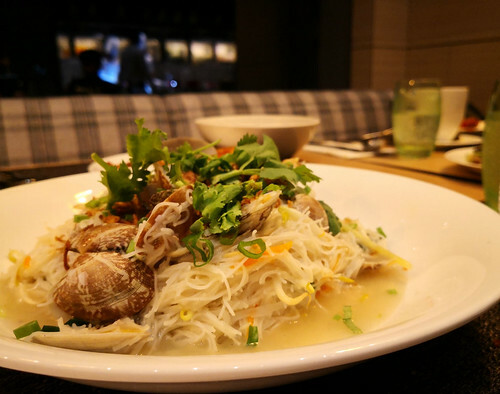 Besides the Western seafood delights, other noteworthy local seafood dishes like the Singapore Chili Crab with Mantou Bun, Black Pepper Prawns, Nyonya Grilled Seabass and the picture above, the LaLa (White Clams) Bee Hoon. The aroma of this dish was strong and alluring, with an umami broth that I can’t help but keep sipping on it. What about the bee hoon? Simply awesomely slurp-able. If you are looking for a place for a romantic date or to hangout with your friends, Sky22 is definitely your choice. For me, I would bring a friend or two to enjoy the good affordable seafood with a view that more than pays the price. 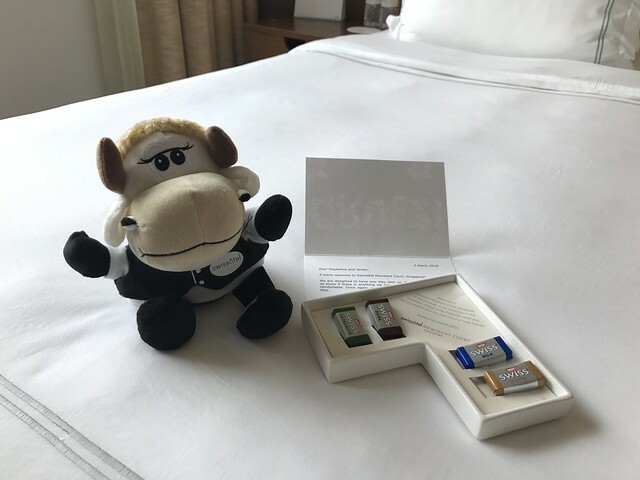 James and I stayed at Swissôtel Merchant Court a few weeks ago and we felt like we were literally a stone throw away from all the activities we can do in Singapore. For example, we are close the most happening nightlife places there. You can also reach Orchard Road or City Hall in less than 10 minutes with a taxi ride. The check-in process was swift and I was also given Niu Niu upon check-in. You can see him later. 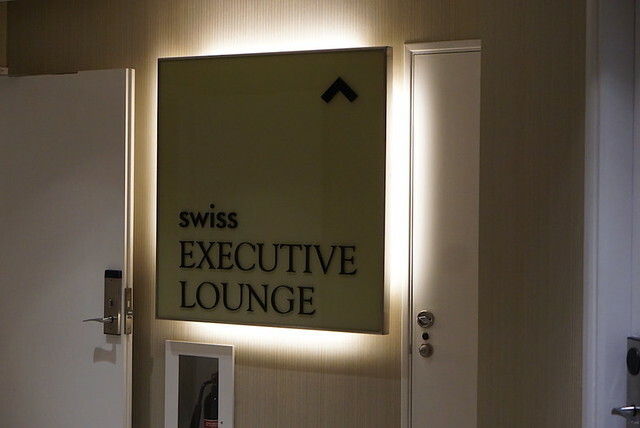 I was given the Swiss Executive Room which entitles me to visit their Executive Lounge for some drinks in the evening or breakfast in the morning. One bonus point was that their staffs were really attentive. I opened the door to a bright and cheery room created with fruits & chocolates. Yes, the cute cow you see there is called Niu Niu, which slept with me through the night. 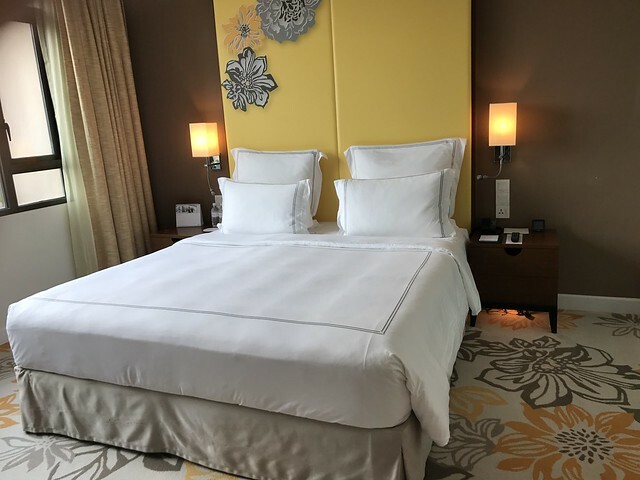 I have always loved hotel beds and fluffy white blankets and those at Swissôtel Merchant Court were no exception. The toilet was spacious and all the amenities I needed were present. I thought that they have very good shampoo & conditioner though. Some hotels provide the duo that leaves my hair dry and tangled but I had absolutely no issues with Swissôtel’s own Purovel brand. Purovel is also the name of their new spa – Purovel Spa, which is convienently located right at level one. Right after exploring the room and finishing a movie in there, we walked over the the Swiss Executive Lounge which is located at the same level. You can enjoy snacks and beverages while reading the latest happenings on the news paper. Psst: Alcohol is included as well! 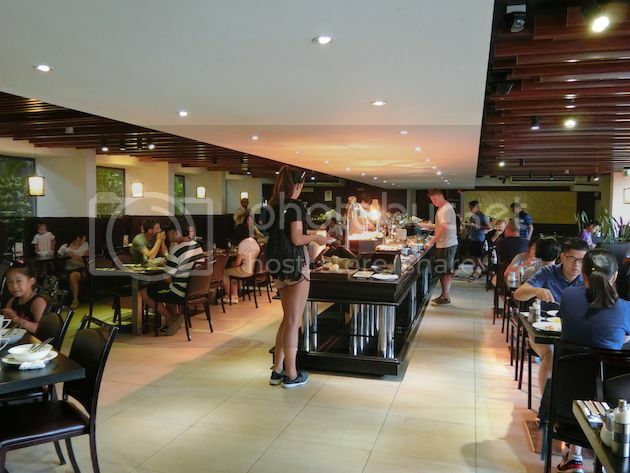 We were given the choice to have our breakfast at the lounge or at their Ellenborough Market Cafe which was revamped and opened a few years ago. James’ even celebrated his birthday there last year. They have a very good variety of food from Chinese to Indian and to Western. What makes the hotel stand out has got to be their pool. When you are there, it gives off a resort feeling and the pool event comes with 2 slides. Tell me, how often do you come across a hotel pool with slides? Little did I know that there are various OOTD spots around the area too. Spot another one on my Instagram (@maybelinesim) sometime this week. 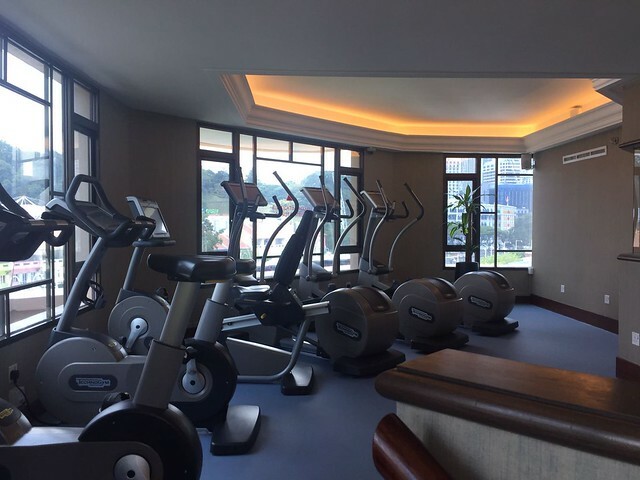 James is the healthy one so he went up to the Fitness Centre to gym 1 hour after breakfast. 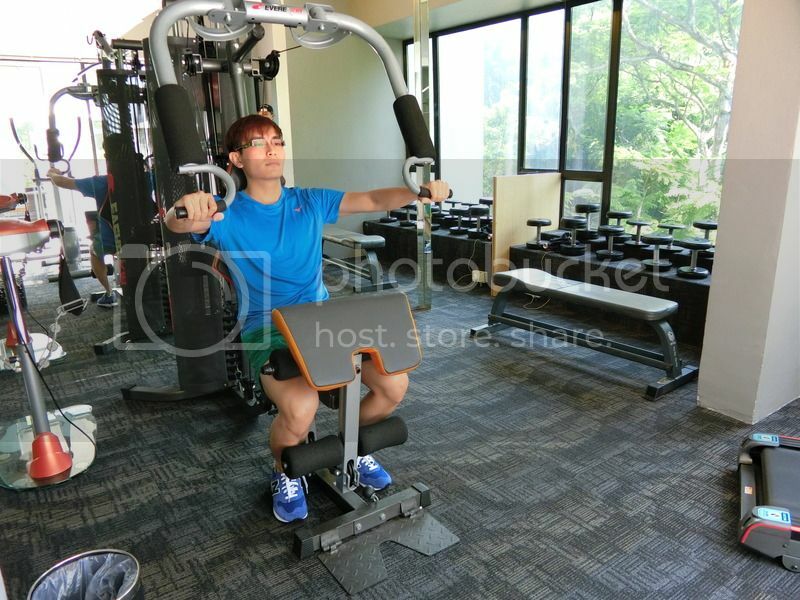 I don’t know how well equipped a gym should look like but he commented that the gym’s facilities are pretty decent. In fact, better than what he had expected. My overall experience was fantastic! I love the walking distance to Central (for a bowl of hot ramen) and the happening night view at night. Usher In The Year Of Dog At SWISSÔTEL Merchant Court Singapore! 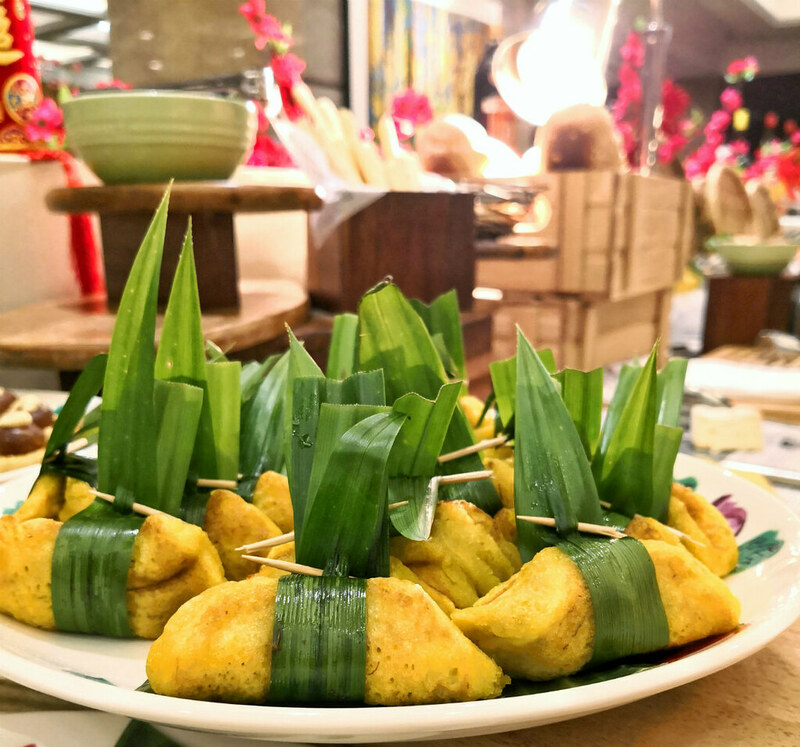 The Lunar New Year is upon us again and this year, Ellenborough Market Café, which is well known for their sumptuous buffet spread, has come up with Prosperity Set meals and buffet which is sure to tantalize your taste buds! 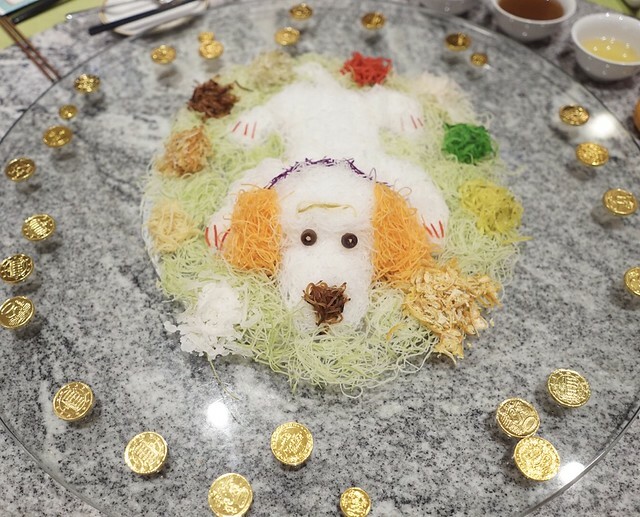 The very cute doggy Yu Sheng is specially created by the chefs for the year of the dog can make any one from the young to the old go awwww this year. 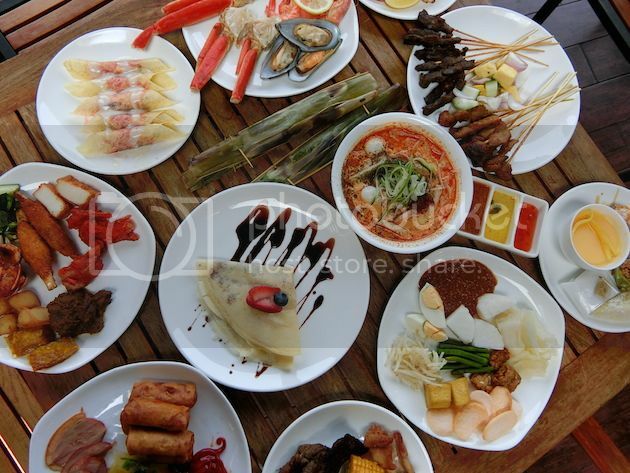 And there are a lot of specially created Chinese New Year dishes to choose from so there is bound to be something for everyone. 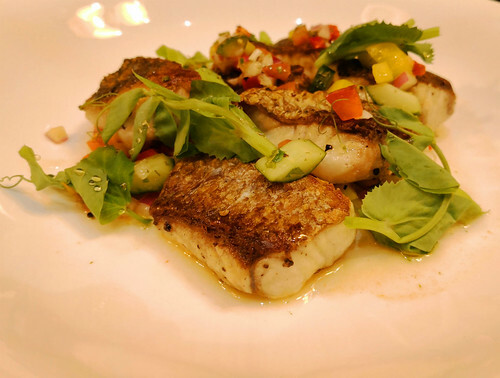 Take a look at some of the other dishes you can expect below. 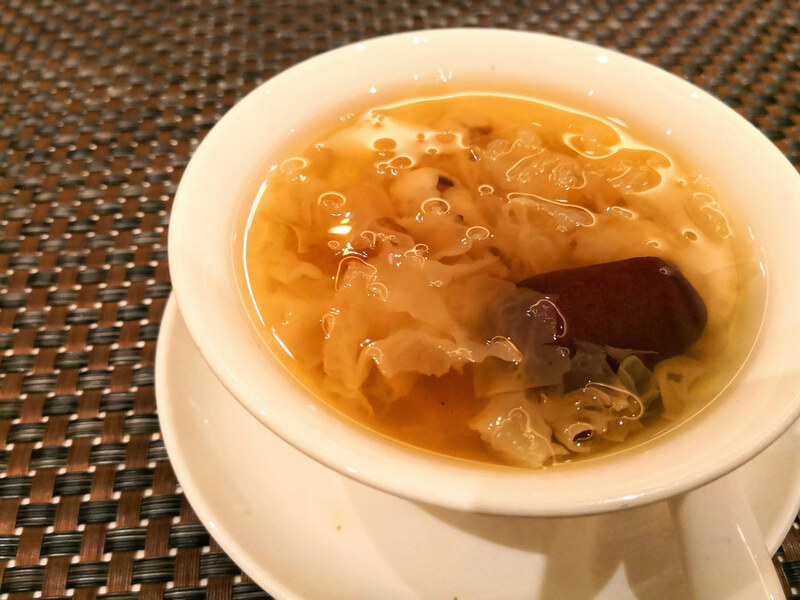 Starting off with the Double-boiled Fish Maw with Dried Scallop and Cordycep Flower, it whets your appetite for more with a palatable and pleasing taste. 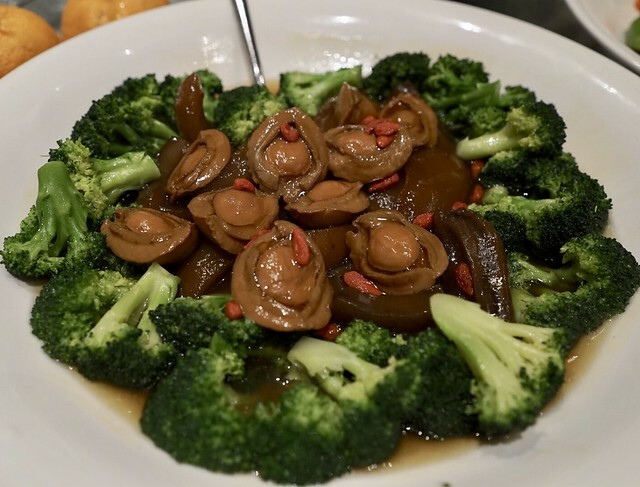 Other dishes in the menu includes Imperial Herbal Chicken, Braised Abalone and Sea Cucumber with Australian Broccoli and to top it up will be the Double-boiled ‘Hasma’ with Red Dates, you can be sure you will be getting your money’s worth. 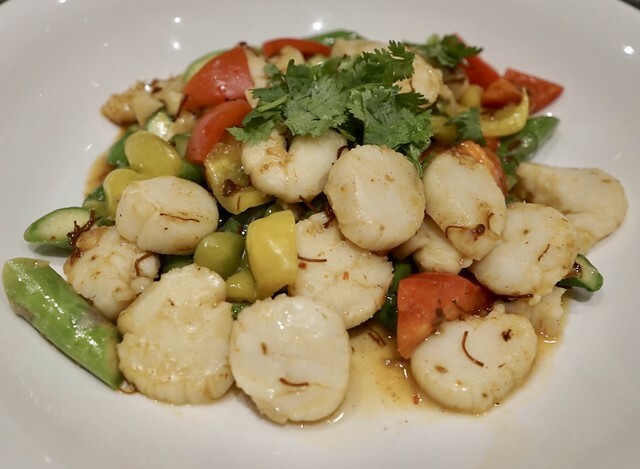 My personal favourite is the Wok-fried Asparagus with Pearl Scallop in XO Sauce, the scallops were very fresh – with a tint of spice, combined with the Asparagus, it leaves a tingling taste on your tastebuds which left me wanting more! available for dinner only at the Roast Station. Head down now to SwissHotel Merchant Court now and try out their sumptuous festive menu! Embark On a Gastronomical Journey with NAMI Omakase Dinner! After months of rigorous renovation, Shangri-La Hotel’s iconic Tower Wing now features a brand new lobby, lounge and suites, along with various interesting flavours that satisfy even the most pernickety eater. The NAMI Restaurant and Bar situated at Level 24 is certainly one such place. Helming the restaurant is Head Chef Akiba Shigeo, who culinary experiences include managing restaurants owned by Iron Chef Koumei Nakamura, along with preparing the wedding banquet the wedding banquet of Japan’s Prince Akishinomiya and Princess Kiko. We were presented with the Kitano Daichi Omakase- a 7 course meal dinner on our night of visit. First on the omakase set was the dual appetisers-Hairy Crab with Tosa Vinegar, and Yuba Tofu & Sea Urchin. We really enjoyed the latter, for its half-chewy texture and fragrant soy flavour. We could literally felt the layers slowly opening up and faint soy flavour spreading through our mouths with each bite (it’s really therapeutic). The addition of the creamy uni added a hint of sweetness to the otherwise bland tofu. Next on the table was the Dashi, a traditional dobin-mushi with Matsutake mushroom, along with pike conger, ginko, homewort and sudachi. Don’t you agree that the presentation is too adorable? We were told to first squeeze the lime in the soup, then drink the soup, and eat the ingredients last. Thankfully, the mushroom flavour was not overwhelming, rather it provided a refreshing aftertaste (thanks to the lime). The soup was really easy on the throat, and comforting to drink. The third course is probably every Singaporean’s favourite- a Sashimi platter which included 5 curated selection of premium sashimi (tuna, amberjack, scallop, botan ebi and flounder) that is air flown into Singapore 4 times a week from Tokyo. Be surprised to find wasabi leaf as one of the accompanying condiment! We tasted the sashimi without any condiments, and were amazed by its freshness. They were unexpectedly crunchy, and exploded in our mouths with natural sweetness. We learnt from the chef that the white meat sashimi are best paired with Himalayan salt to bring out the natural flavours. Fourth on the set was Tempura consisting of capelin fish, pumpkin, kidney beans and lotus root. I was utterly glad that the dish did not carry any rancid smell or cloying oily. Unlike the usual tempura, NAMI’s rendition provided a much lighter and fluffier batter, which was really crispy to bite on. The main dish was none other than the Saga Beef Sirloin Steak with Seasoned Grilled Oita Shiitake. The steak was really tender, and literally melted in our mouths. Each mouthful was accompanied by wonderful waves of sweet and buttery flavour that sent a small but puddle of pleasure through our spines. We felt that the sweet-savoury sauce did a great job in balancing out the fatty flavour of the dish. Next, Matsutake Mushroom Rice along with miso soup and pickles were served. 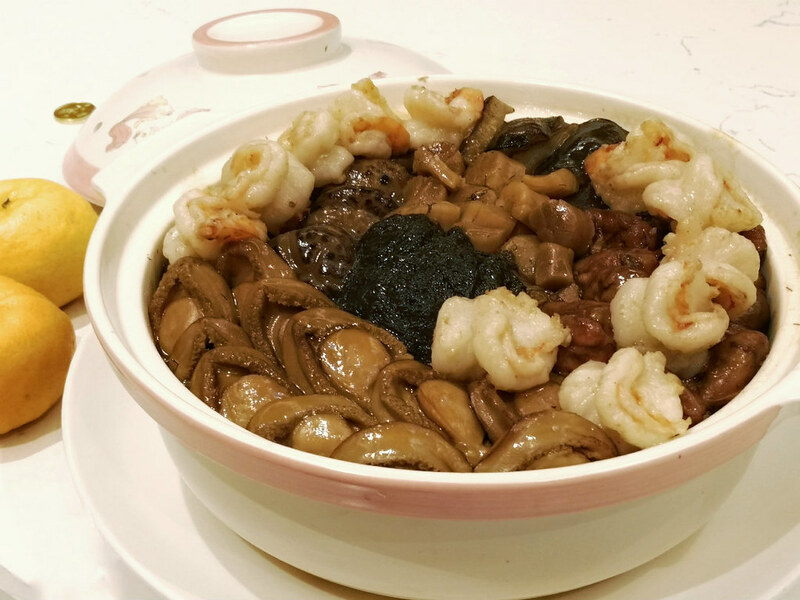 The pairing of the steamed rice and mushroom was indeed brilliant, for the latter imparted its sweet nutty notes and transformed the rice into a delicately flavoursome dish. Instead of the usual beige coloured miso soup, NAMI’s version skewed towards the brownish side. 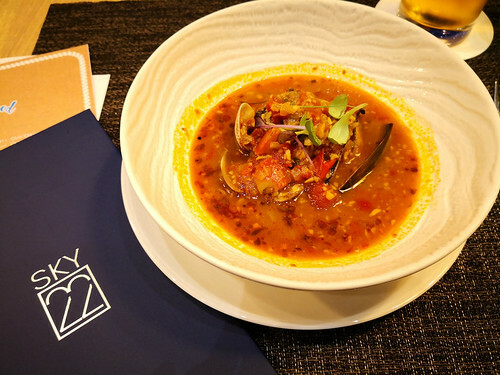 We particularly love the soup for its rich toasty malt and caramel flavours, in fact it reminded us of the Misokatsu from Yabaton at Nagoya Station. The Chinese yam might look harmless, yet it’s really spicy, so do take small bites! Our dinner was completed with a plate of seasonal fruits made up of melon, crystal pear and grapes. All we could say is, till now we’re still reminiscing the sweet taste of the melon. Yes once again I am out for a staycation! I always enjoy a short dose of staycation to help me retain my sanity in this relatively fast pace city. This time around, my short escape from Lion city’s hustle and bustle is Mecure Hotel Singapore Bugis. Located within walking distance from Bugis village which is our equivalent of Bangkok’s Chatukchak & Seoul’s Gangnam Underground shopping centre. 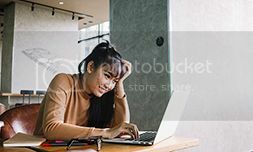 A little tips for the foreigners reading this post: Shopping here is considered most affordable in Singapore and usually it can easily take up at least a day to comb the entire shopping compound! So foreigners staying near here have an added advantage of exchanging more commuting time to shopping time! Don’t worry even if you are done with Bugis Village within a day, there are many other shopping centres within walking distance. Singapore’s biggest and oldest electronic mall (Sim Lim Square) is also a stone’s thrown away from the hotel. If you wish to find cheapest watch deals in Singapore, there is Bencoolen Mall. To satisfy the foodies, there is no lack of local & international cuisines located at the shopping malls peppered around Bugis eg Bugis Plus, Bugis Junction etc. Now, let’s move on to the hotel. I shall let the pictures do the talking for this point. Interesting famed up images lining the corridor while you make a beeline for your room. In this case, we were given the room. 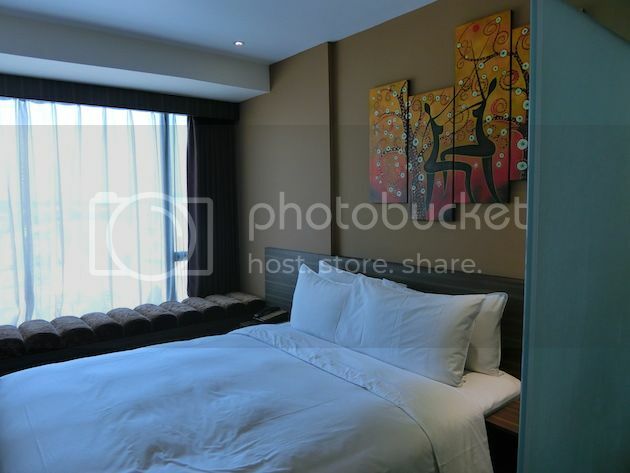 It is a double-storey room with the bed located on the second floor which can easily house 5-10 people within the room. 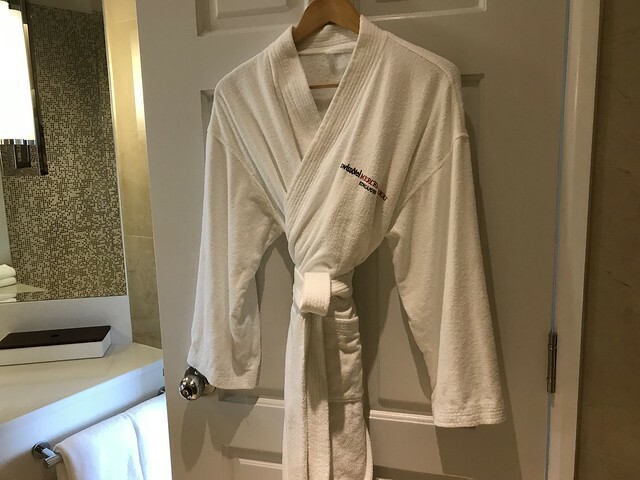 Upon opening the door to the room, you will be greeted with the open concept bathroom. Well equipped with basic amenities e.g. Bath gel, toothbrush, Shampoo, conditioner etc. Basically, you do not have to bring or buy any of these items. Just bring yourself and many many sets of clothes for taking IG-worthy pictures! Other practical items within the room include coffee machine, teabags, two TVs (for each floor) with access to movie, documentary & local channels & most importantly a complimentary handy (for calls, SMS & GPS). Which means now you can afford not to bring along your phone as well! Lol! While I look down from the second floor, I found the best angle to capture the simplicity & artsiness of the whole room! Glad we brought along a few outfits to do #ootd shots! There are a myriad of quirky-looking chairs in alfresco settings (Below). 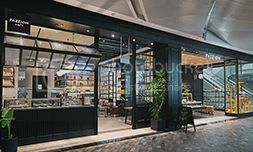 If you are into vintage, you are going to adore this hotel even more as there are a lot of backdrops with old, ubiquitous HDB flats, most recognized internationally as Singapore’s unique landscape. Just imagine how many pictures you can take with this beautiful contrast here! Yearning for a city view? Be sure to visit their Infinity Pool (1.2m in height). Do a couple of laps & take a short break to enjoy a good view of the city landscape. If not for a swim, this is a good spot to get some Vitamin D from the sun. Right next to the swimming pool is a small juccuzi which you can enjoy the city view in another angle. The Gym (same floor as the swimming pool & Jaccuzi). There are not a lot of equipment in here but there are still the basic ones enough for you to shed some calories eg Treadmill, weights etc. The beds and blankets were overly soft and comfortable. We sure had a difficult time getting up in the morning. We requested for late check out because M wanted to sleep in more after breakfast. If you are keen in exploring the F&B, I will highly recommend the Royale. In fact, the breakfast is also served at this restaurant. 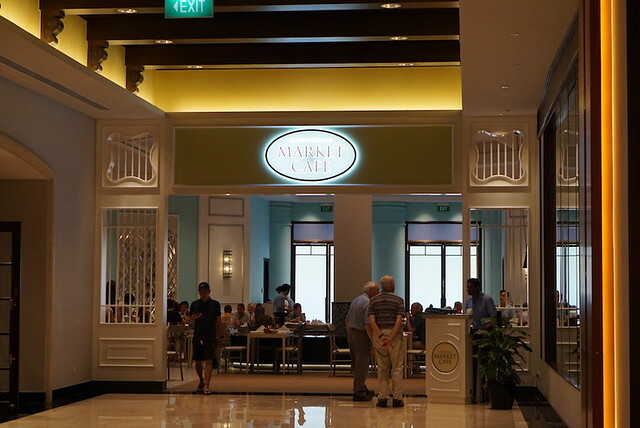 For Dinner, you have a choice of Peranakan based Buffet or western Ala Carte cuisines. The Buffet is valid on Fridays and Saturdays only from now till 26 August 2017. One of my favourite Ala Carte dish in their menu was the Salmon. It may look well cooked on the exterior but the interior is extremely soft and tender. Nonetheless, the portion isn’t extremely big. Hence, if you are a big eater, you might want to consider going for the Buffet instead. Breakfast was good with a considerable variety e.g. eggs, hashbrowns, ham, sausages, beans, cereals etc. Last but not least, know where is my favourite hangout place other than the room itself? The bar counter where they serves drinks till late night. 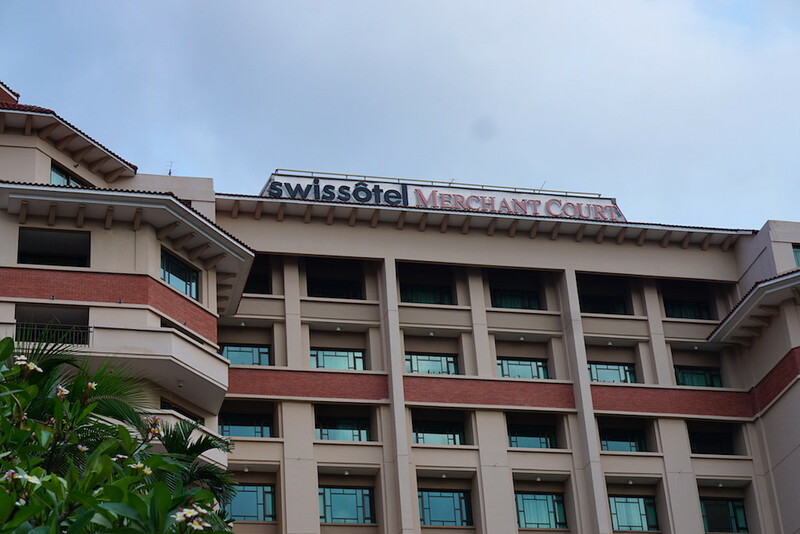 Mercure Hotel Singapore Bugis is located at 122 Middle Rd, Singapore 188973. 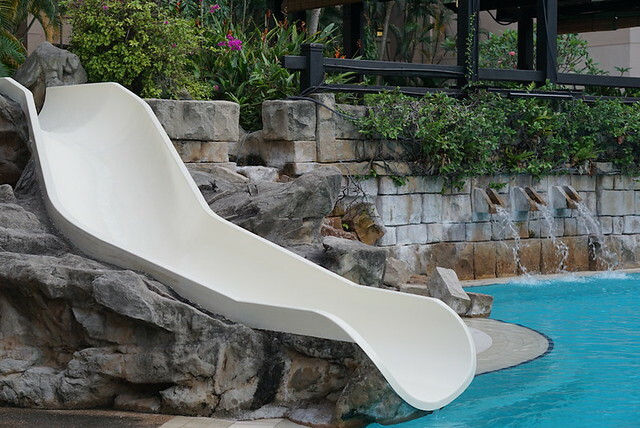 If you want to stay near one of Singapore’s most iconic beach (Sentosa) comfortably yet affordably , then I would say Bay Hotel Singapore is the BEST option for you! Let me just do a simple quick summary for you so that you can always remember this hotel easily! It is simply because Bay Hotel is…. Located strategically also at the gateway of Sentosa and at the foot of Mount Faber. 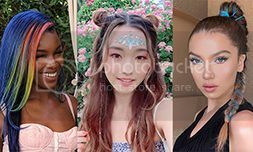 Should this short summary not hit the sweet spot for you literally, let me shower you with more details on these aspects according to our own recent experience. And so once again #JamesnMaybel is ALL ready for our next Hotel review! Firstly, let me give you some context on how accessible this location is especially for tourists visiting Singapore for the first time. 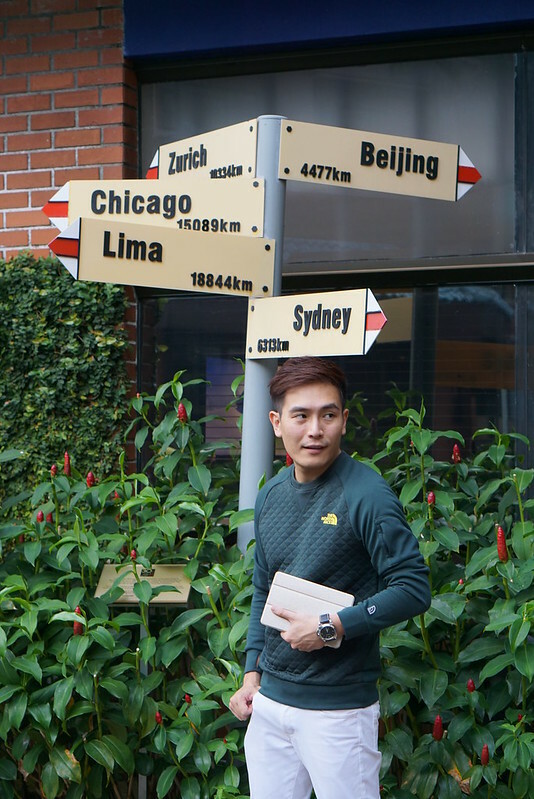 Let’s just say this hotel is just ONE traffic light away from the Biggest Shopping mall in Singapore, VivoCity (located at Harbourfront MRT Station) and walking distance to Sentosa (Most Iconic Beach in Singapore). The room given to us for this Hotel review is their ‘Deluxe’ Room. 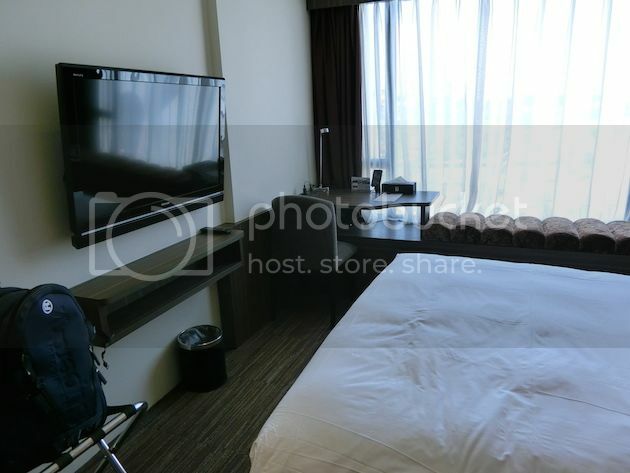 I like the cosy, simplistic concept & earthly tones within the room which kind of makes you feel rooted to Singapore already. The walk around space is decent for 2-3 person with a comfortable bed large enough to accommodate even 3 sleepers. If not, the ‘unlucky’ odd one out can always take the caterpillar cushion by the side of the window! >< Just kidding! But trust me, you wouldn’t want to miss out on the super fluffy bed here which is comparable to any 4 to 5 star hotels locally! However, if you do get the caterpillar cushion ‘bed’, don’t sulk. Because you are in for the best view within the room; One that overlooks Vivocity & Sentosa! This view (below) getting increasingly beautiful as the sun set. Moving onto the features within the room. They have all the basic features within a room such as TV and writing table etc. Nonetheless, one of the tourist-friendly feature resting on the writing table is this Handy smartphone which allows for complimentary IDD calls to selected countries! So you are still connected be it locally or overseas! One thing I like about this room is the snacks and drinks are ALL complimentary! For the drinks selection, this is not ALL! Within the refrigerator, there are 7-8 canned drinks such as beers eg Anchor, gassy & non-gassy soft drinks. Also inclusive are 3 packets of snacks eg mixed nuts & potato chips. 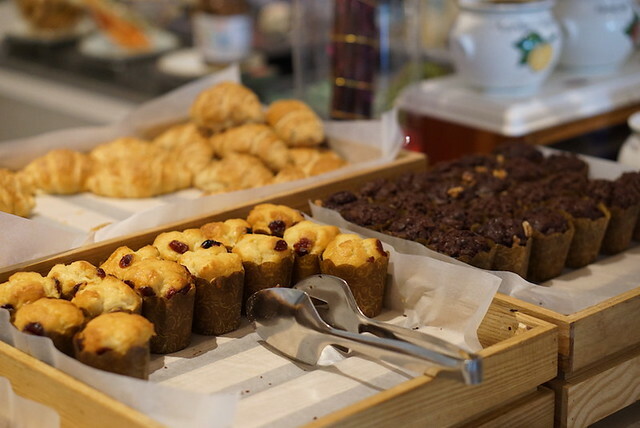 Going hungry is definitely the last thing that will happen to you during your stay! 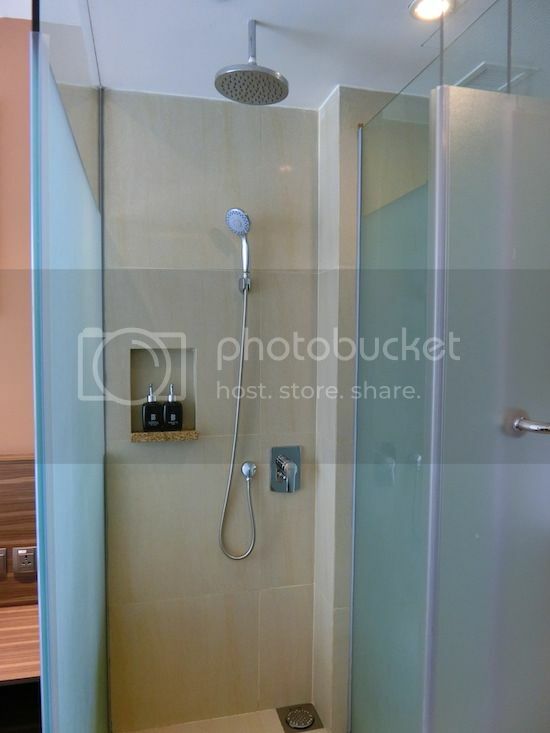 Rain Shower with decent space to accommodate two person bathing at one go. Appreciate the fact that they give a big bottle of shampoo & bathing gel. I am not sure how many of you would understand the frustration of having to ration for these two items even for a one night stay! I have stayed in hotels which give you those ‘sample’ size bottles which seems only enough for one person usage! Luckily, you do not have to worry on such issues here! Getting out of the room, let’s check out their amenities! I am glad they have an Infinity Pool & Gym as these are the two places I will always visit when I stay in a hotel. Even though the infinity pool here does not offer the picturesque, breathe-taking view of any 5-star hotel, there are two things I absolutely like about it: An undisturbed Nature’s view & glass protection. This allows anyone especially parents to have a peace of mind while enjoying this sanctuary. While my dear M is indulging in her poolside shots, I get to indulge in my manly business aka Gym! Technically, its for me to burn off all the calories built during the scrumptious food tastings within this hotel (which I will share more below)! Do not expect an extremely well equipped big gym. 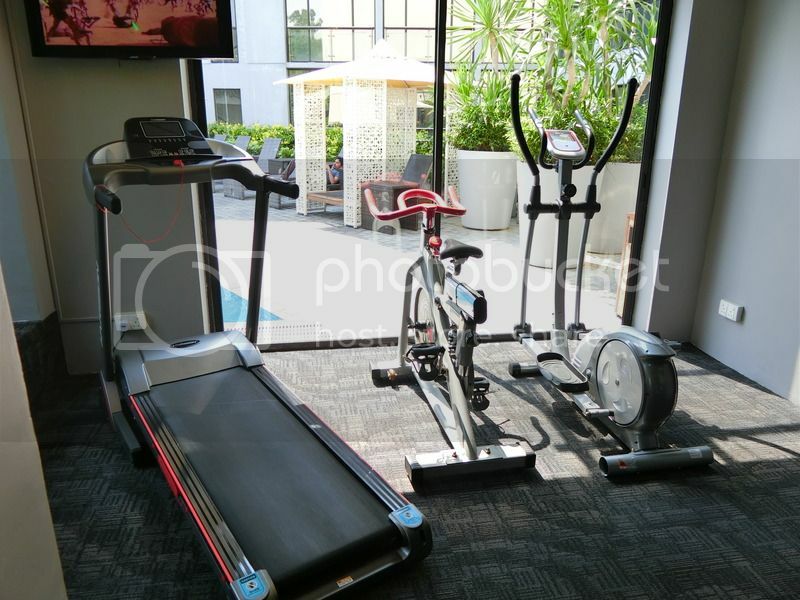 Nonetheless, they have all ample equipment for you to sweat it out with! 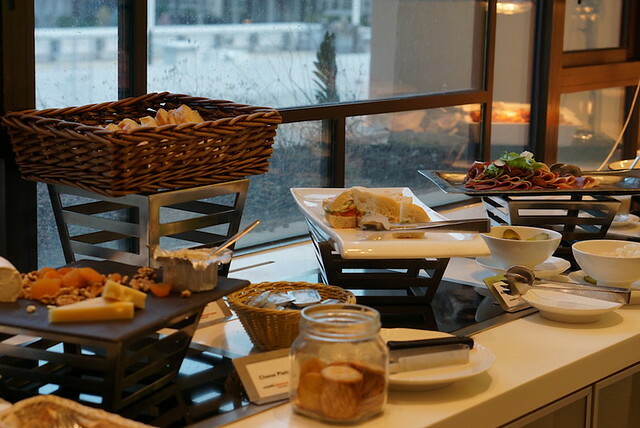 The stay comes with a complimentary breakfast the next day to cure your hungry stomach. Be sure to come down early especially when the occupancy rate is high during holidays. 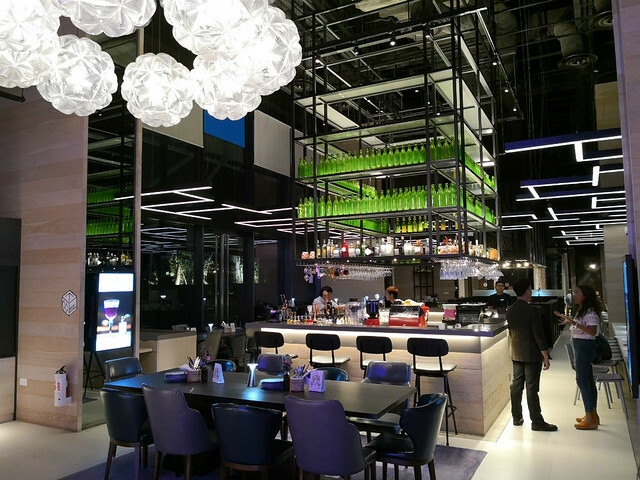 You are sure to get your seats at the popular ‘ Street50’ restaurant due to its large seating capacity. BUT I cannot guarantee you will get your favorite food if you are late! The chef consistently ensure that you get hot pipping food served! Yummilicious! The spread they have for breakfast is also pretty generous! M was totally head over heels with their Chocolate Donut balls which seeks to satisfy the sweet-tooth! For me, it just had to be their hot crunchy nuggets! I had like a 20 piece nugget meal myself! 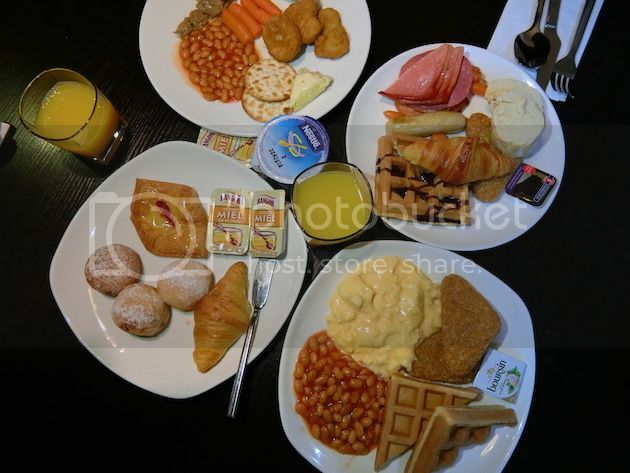 Other food includes scrambled eggs, Ham, Croissant, yogurt, muesli, waffles, different variety of cheese, hash browns and many more! For all those who are in for shopping spree & beaches, this hotel is a definite must stay! 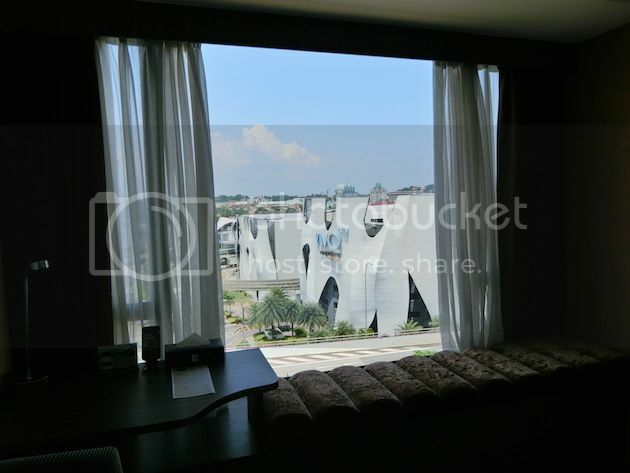 Where else can you get an affordable room in the central which is within a stone’s thrown away from the biggest shopping complex and our iconic beach, Sentosa! Not applicable for the period of 15 – 18 Sep 2016. If you are planing for food venture tour instead of a shopping spree, I will highly urge you to try out their ‘Singapore Food Story’ Weekend Buffet lunch! 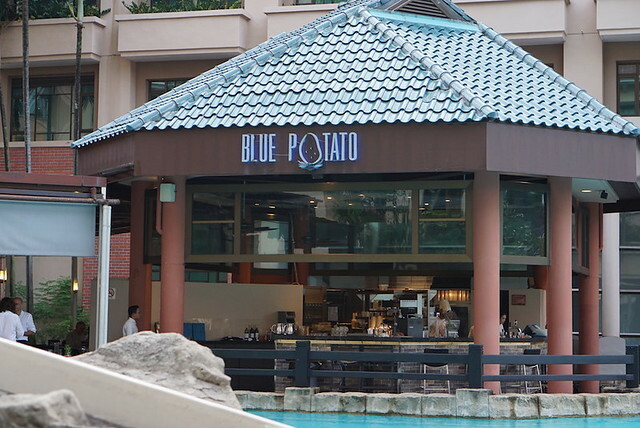 For Foreigners – Unless you are staying for a good one week in Singapore, chances is that you are going to miss out either one or two of our famous local delicacies. With this buffet, you are almost able to capture all our famous local delights across different races eg Malay Satay, Indian Rojak etc. For Locals – Yes, you guys might already be familiar with the local delicacies since you stayed almost half your life here. It would then be the affordability and quality of the local food! I would say the new chef makes a good concerted effort with perfecting every local cuisines on the table here especially the Laksa which Maybel had two bowls in a row. For me, it’s their satay as he made it extremely palatable without overly burning it! Especially, I have see really ‘carcinogenic’ ones elsewhere! 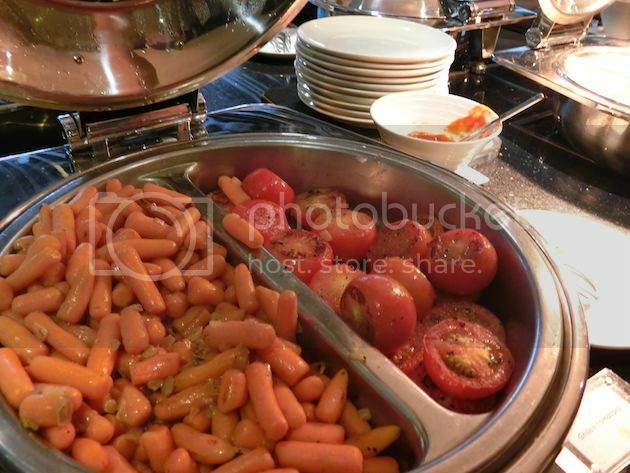 Apart from local cuisines, they also have additional ‘Grill’ Stations that prepares Grilled Beef, Chicken and etc. So in totality, their spread is definitely generous and bang for buck! 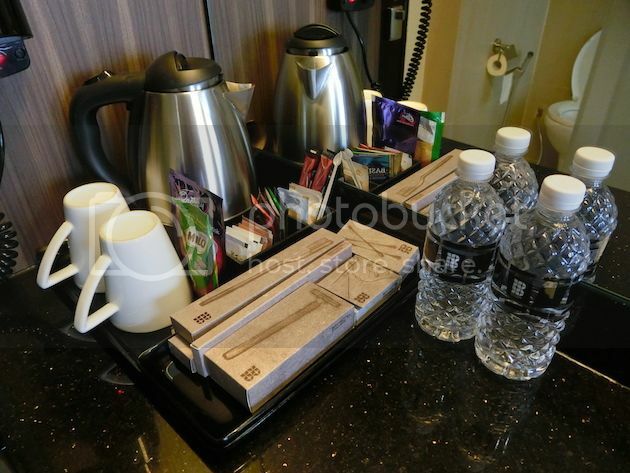 Bay Hotel is located at 50 Telok Blangah Road Singapore 098828.